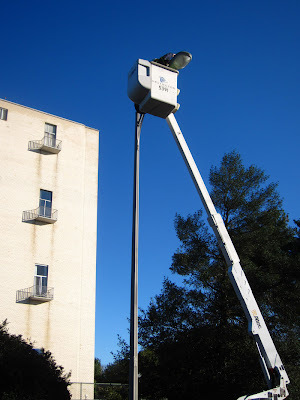 An Arlington County worker single-handedly changed three burnt-out streetlight bulbs on N. 12th St. last week. The Ode Street Tribune has heard many reports that it takes up to ten persons to change a light bulb (reports vary as to the persons' occupations). Without the help of Arlington County workers, many Arlington residents would be in the dark.